Play as a small goldfish with an insatiable appetite. After being overfed by your owner, you'll escape into the ocean and begin to eat everything that you encounter. The more you eat, the bigger you get! Eat shrimp, turtles, sharks, submarines, houses, airplanes, and more! In addition to the goldfish, you can also play as a dolphin and a shark. The dolphin starts off as an overworked aquarium star, forced to jump through flaming hoops for food. He escapes from captivity by eating his way through the aquarium and taking revenge on his trainer. 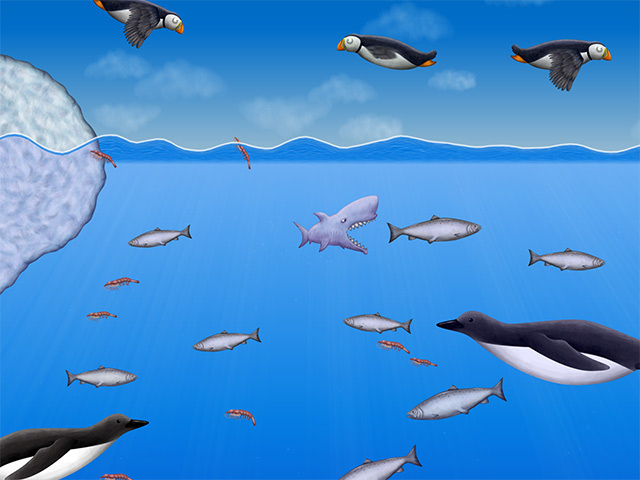 The shark is the final playable character, an artificial fish created by scientists to save Earth's oceans. It uses self-replicating nano-technology to consume everything in its path and convert their matter into its own. There's no telling how big this shark will get. Get Tasty Blue and eat everything in the ocean! 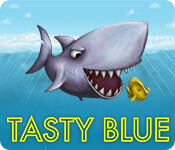 Tasty Blue is rated 4.6 out of 5 by 29. Rated 5 out of 5 by Nellskid from What a terrific game!!! I usually do not like games that require quick cursor movements; but, this one is MARVELOUS!!! The concept is hilarious, the art work is great and the fun quotient rates in the highest. Who doesn't enjoy fish growing large enough to battle helicopters?!? If you have never tried this type of game, this is the one. A definite buy!! Rated 5 out of 5 by Luigifan27 from One of the best. Pros:Fun Storyline OK:Motion Sickness Cons:The only thing bad about this game is that i'm a real animal lover so I did not like eating the animals. Very fun great game. Rated 5 out of 5 by ns045 from So much fun to play. This game is hilarious. You make your fish eat everything in sight (including people) while cheerful music is playing in the background (my favorite is the Irish folk music). Even though some of the animals and the people utter a sound when you swallow them there is no gore at all. I let my 4-year old play this game. It's not a mind bender but there is some challenge to the game, which makes it fun for adults, too. You cannot eat anything bigger than yourself but the more you eat the bigger you get. Some of the potential prey is initially harmful when you get in contact with it while you are still small. Swimming into them hinders your growth, which means you have to avoid them until you're big enough to eat them. Some times you cannot get from one place to another until you're bigger and can jump higher, while other times you cannot enter a place once you're too big. I would recommend to play that on a computer that has a touch screen. Rated 5 out of 5 by kerith90angel from I think this would be great for adults & kids! BASED ON COMPLETED DEMO This game came out in 6-2014 and it was offered as todays buy at 2.99 At first I grumbled and didn't think it was my thing.... So like I always do, I checked the all the reviews to see what the other fish in THIS pond were thinking. A review by Kristidumplin made me finally decide to give it a download. I agree 100%. This game is an absolute addictive blast. 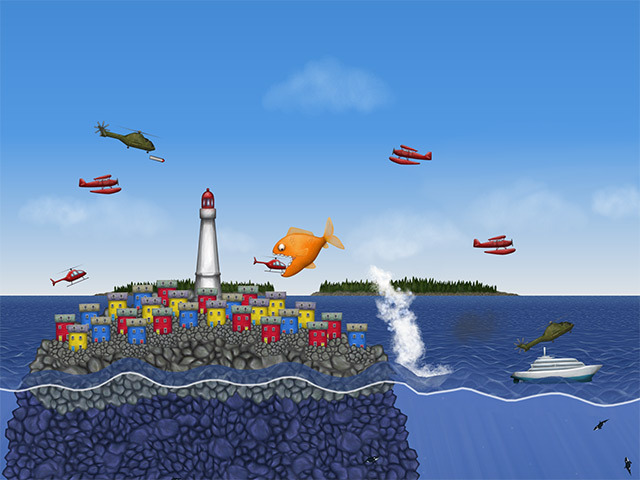 Throughout the game, you will play as 3 different types of fish. First you start out as a goldfish in a bowl. Your owner keeps putting food in even though it says clearly on the label, "Do not overfeed". So being too big for your bowl, you hop into the bathroom plumbing and end up in the public water supply! You eat and eat any fish (or edible) that is smaller than you. Some things can't be eaten and will kill you and sometimes you need to avoid certain species until you are big enough to eat them. Each level, like most games, gets harder and harder, and you will jump for seagulls.... bummer.... another reviewer mentioned being an avid animal lover, like me, but since they are cartoon-like, it softens the blow. Too bad we weren't jumping to snap up bullies instead, right? ha, ha. I really didn't like the music, so I played Pandora instead. He does make cute little sound effects like "yum, yum". Its quite comical and its more of an arcade game and just a fun change from the HOG, Match 3, and Time Management games I usually play that take up so much of my time. I hope they will clarify the graphics further, as they are good not great if they ever come up with a newer edition of this or a similar game. You really do need to go into "options" first and adjust the graphics to fit your computer. As soon as the demo ended I purchased the game. I'm so siked I found it late to get this great sale on it! Rated 5 out of 5 by Bumper1788 from Try it, then buy it! This has got to be one of the silliest, most fun games I've ever played. After buying around 300 games, I really slowed down buying, I wanted to find something different, and Tasty Blue is it; It's addictive. I work at home, and keep it on the screen for (frequent) breaks. I have it on the laptop in front of the TV. It's a totally different genre, I'm not sure what you'd call it. Try it, and see if you can just stop in the middle of a level. I can't. All I can say is try it, then buy it. 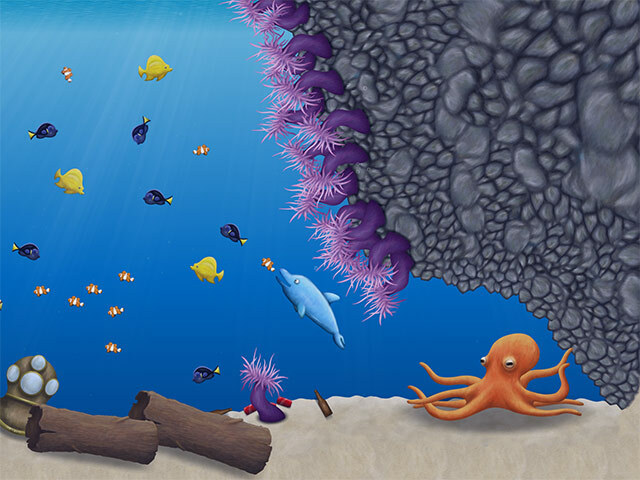 Rated 5 out of 5 by mapper454 from Great fun and adjustable difficulty level This is a lot of fun and quite addictive -- catching fish, frogs, divers, seagulls.... I love that the game has easy to difficult levels, so I can play as well as my 4-yr old grandson in easy mode. Great family game. It's fun and humorous, with great graphics and sound effects. Rated 5 out of 5 by DieHardFan from Tasty Blue I loved it. I'm waiting for a sequel. Rated 5 out of 5 by dinga78 from So much fun! I don't often review games but I had to let everyone know how addictive and entertaining this game is! It's humorous and easy enough for kids to play but if you want to make the achievements, you've got to hustle! Fun noises and animation make all the more entertaining. Come and eat some divers and helicopters! Play as a small goldfish with an insatiable appetite. The more you eat, the bigger you get!